"My name is Sam Bicke, and I consider myself a grain of sand on this beach called America." It is often said that assassins of political leaders are trying to draw attention to themselves, as well as to initiate some great change that is believed to occur in the aftermath. But what of the potential assassin whose plans are not just unsuccessful, but also go unnoticed, as well? That "woulda, coulda" premise is the underlying tenet of this 2004 Niels Mueller drama set in 1975, where the would-be killer is an everyday joe named Sam Bicke (Sean Penn), pushed to the edge by a variety of things—including a failed marriage and job he feels is built on a foundation of lies. Bicke has convinced himself that Richard Nixon must die in order to help reshape the future of the American Dream for the rest of us "grains of sand" out there in the real world. The closing credits indicate that the film is "inspired by a true story", and of course history tells us Nixon was never assassinated, so it's clear from the outset that the plot's master plan was somehow flawed, and as Mueller slowly dismantles Bicke's life before our eyes, it is almost possible to actually feel the squeeze of the imaginary vise around his skull as everything he holds dear and important suddenly evaporates, leaving him to attempt to fulfill a destiny that had its roots in a throwaway comment made over drinks by his gruff sales boss Jack (Jack Thompson). Penn's Bicke seems like a pleasant enough fellow, though a bit awkward and short on basic conversational and people skills, which briefly stretches the believability factor that he could have ever been married (unsuccessfully or not) and have three kids with his soon-to-be ex, played wonderfully with ever-increasing waves of exasperation by Naomi Watts. Bicke's only real friend is the level-headed Bonny (Don Cheadle), who runs a dilapidated car repair shop and has plans to partner up on a get-rich scheme to develop a mobile tire delivery business, but that too becomes a chink in the armor of the grand plan. Like him or not personally, when you get a Sean Penn film these days, it's almost a guarantee that there will be some high-caliber acting histrionics. Check, check, and double check here, as Penn does a terrific slow burn through the first hour or so being dumped on before beginning that dramatic tumble over the edge, where sudden outbursts, uncontrollable sobbing or acts of violence give him room to show why he is one of the most watchable actors working today. Mueller interjects some odd elements of comedy, as when Bicke feels a connection with the radical Black Panther Party, and tries in vain to encourage them to change their name to the "Zebras", in order to increase their potential membership with whites. 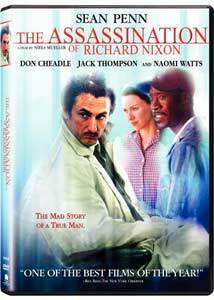 But The Assassination of Richard Nixon is more drama than thriller, a powerful and moving story of yet another man who would not take it any more, anchored by a great Sean Penn performance. Image Transfer Review: A beautiful-looking 1.85:1 anamorphic widescreen transfer from New Line here, something that is becoming something of an expectation. Nice color rendering, with fleshtones looking natural, balanced by strong black levels. Some minor shimmer, most evident on ties and signs, mars an otherwise gorgeous transfer. Audio Transfer Review: The primary audio option here is a 5.1 Dolby Digital surround track, and though this essentially a "talkie", the front channels offer some expanded directionality for small sound cues that dramatically broaden the soundstage. Rear channels kick in a couple times, used for things like airplanes, but remain mostly silent. A 2.0 English stereo track is also provided. Extras Review: No extras other than a couple of trailers, 20 chapter stops and optional subtitles (English or Spanish). A film like this might slip in under the radar, so make an effort to seek it out. A bittersweet downward spiral of a performance by Sean Penn seals the deal here, making it an intense and sorrowful experience at the same time.